Before 1992, Public issues were governed by Chief Controller of Capital Issues (CCCI). 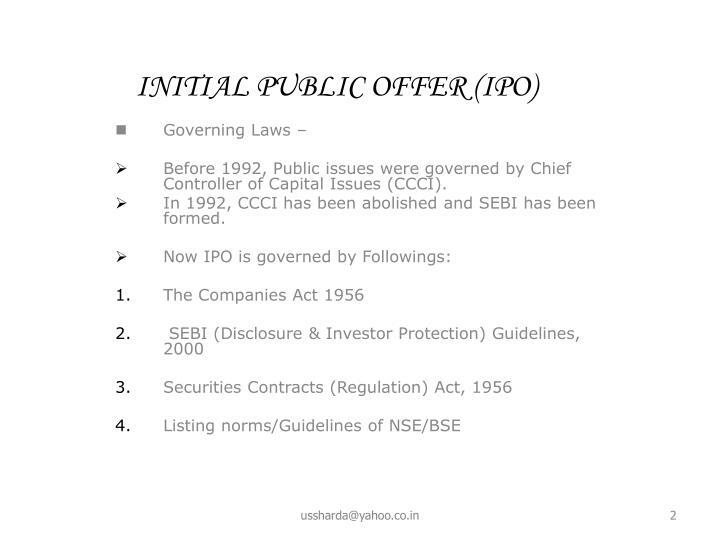 In 1992, CCCI has been abolished and SEBI has been formed. 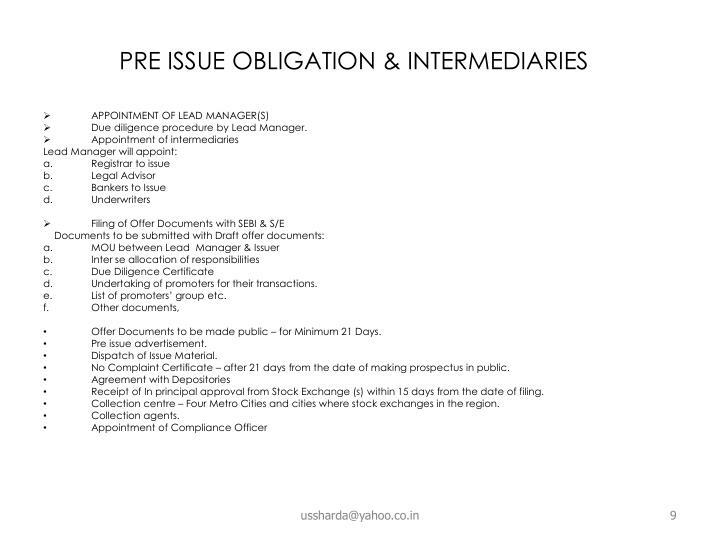 Filing of draft offer document with SEBI through eligible Merchant Banker at least 30 days prior to filing of prospectus with ROC. Any company prohibited by Board can not make an issue of security. 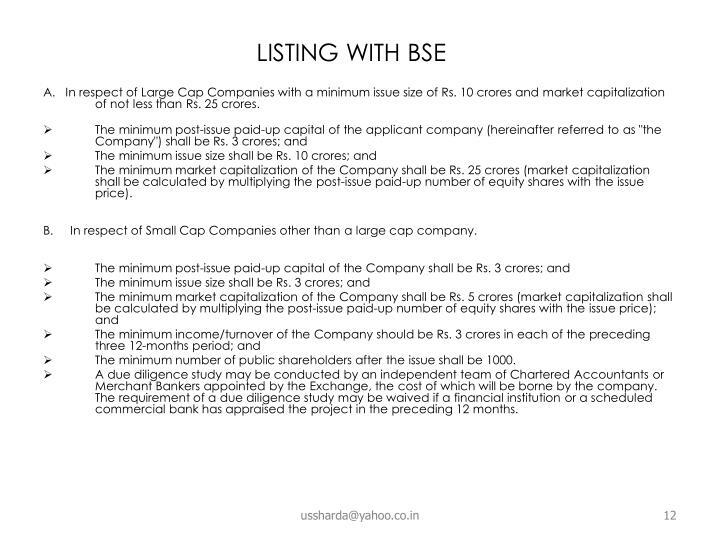 Filing of application with Stock exchange for listing and in principal approval is required. Issue of securities in dematerialized form. Unlisted company can not make allotment pursuant to public issue unless prospective allottees are less than 1000 in numbers. 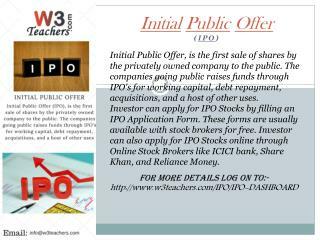 Shares can be offered to public either in the form of IPO or offer for sale. for a period of more than 6 months. 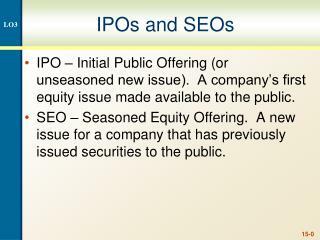 holders an option to receive shares after IPO. There should not be partly paid shares. Firm arrangement of 75% means of finance. 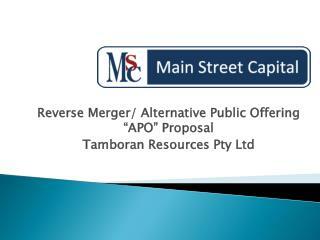 Grading of IPO from at least one credit rating agency. Disclosure of all grading has been to made. 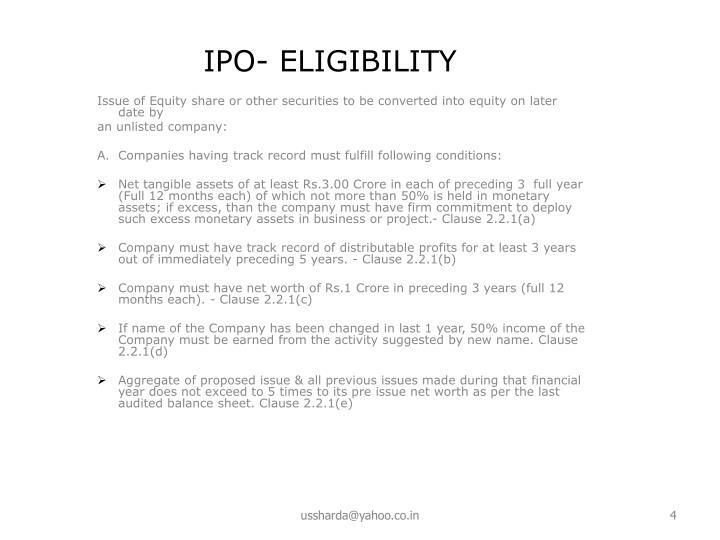 Disclosure of all expenses incurred for obtaining grading for IPO. (i) Issue through book building process with at least 50% of net offer to public to be issued to QIB. Project has been appraised & at least 15% participation by FI/Sched. Commercial banks, of which at least 10% from appraiser & at least 10% of issue size from QIBs. (ii) Minimum post issue face value of capital Rs.10.00 Crore. 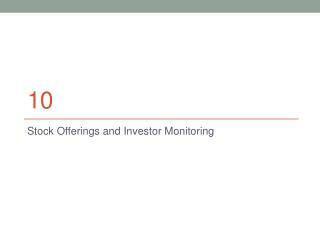 to offer buy & sell quotes for a minimum depth of 300 shares. To ensure bid ask spread for their quotes shall not exceed at any time 10%. 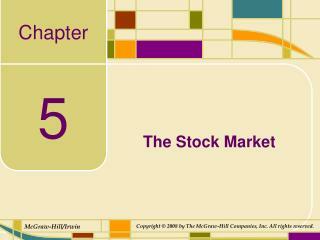 Inventory of market maker on each stock exchange shall be at least of 5% of the proposed issue. In case of partnership firms are converted into Company, track record for distributable profit shall be considered, if the accounts are revised in the format prescribed as per companies Act and conforming all accounting standards. IPO by Banks (Subject to approval of RBI). Unlisted Company : Firm allotment may be made on higher price than the price officer to Public. If equity shares or securities convertible into shares are issued to retail individual investor/retail individual share holder, the same can be issued at lower price than to other categories. The difference shall not exceed 10%. 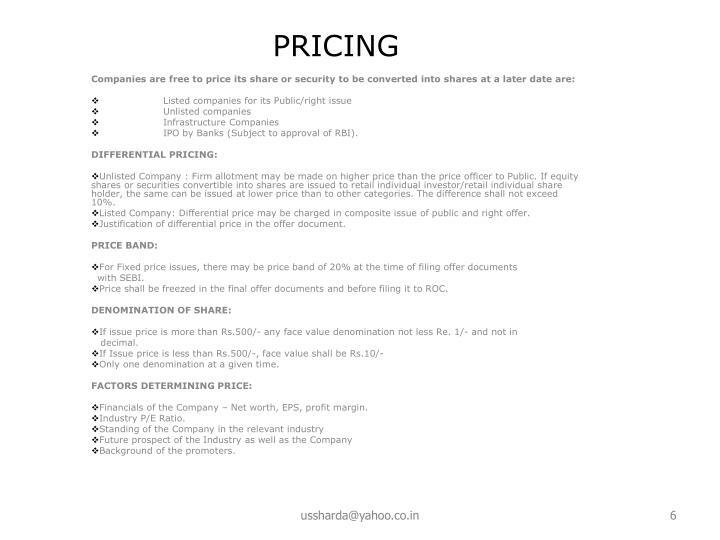 Listed Company: Differential price may be charged in composite issue of public and right offer. 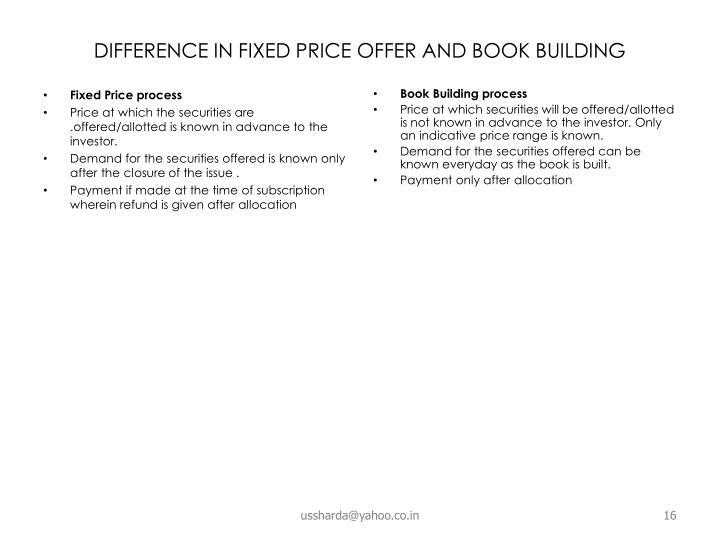 Justification of differential price in the offer document. Price shall be freezed in the final offer documents and before filing it to ROC. Only one denomination at a given time. Financials of the Company – Net worth, EPS, profit margin. Composite issue: 20% of proposed issue or 20% of post issue capital (Right issue component shall be excluded from Post Issue Capital) . Issue of any share with in preceding 3 years out of revaluation of assets or capitalization of intangible assets. Resulting from Bonus issue out of revaluation reserves or reserves without cash generation or against the shares which are not eligible to form part of promoters contribution. Any securities acquired by promoters within one year at a price lower than the offer price. 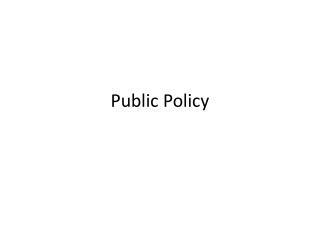 (whether issued to acquired by promoters otherwise) (If difference of the same has been brought out before opening of issue, than eligible). Application less than Rs.25000/- in case of individual and Rs.100000/- in case of firm or body corporate. Any private placement made by solicitation of subscription from unrelated person directly or through intermediary. Contributors who have not given their specific consent for promoters contribution and lock in period. 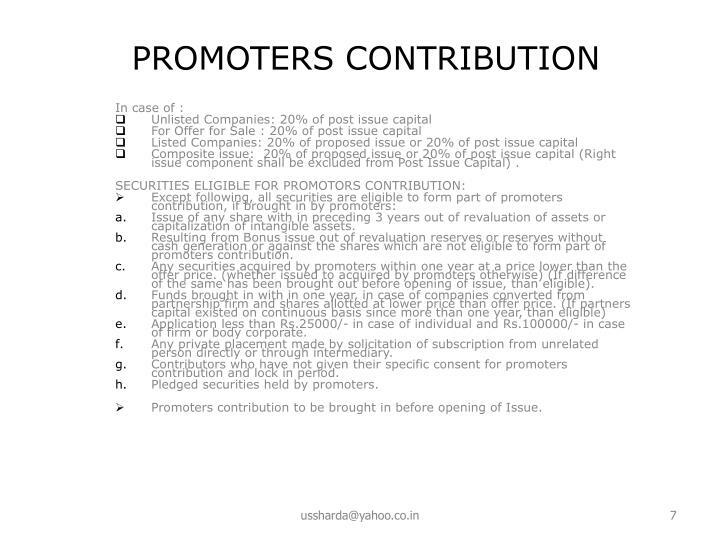 Pledged securities held by promoters. Promoters contribution to be brought in before opening of Issue. 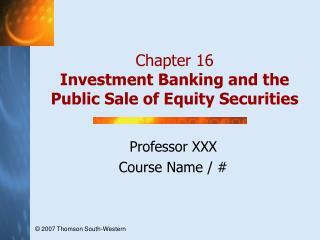 Basis of Lock in – Last allotted share locked in first – Omitted since 29.11.07. 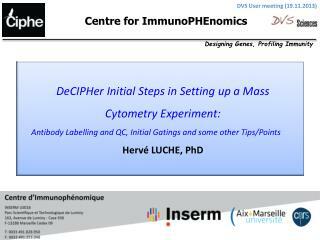 Inter se transfer amongst promoter permissible. Due diligence procedure by Lead Manager. Undertaking of promoters for their transactions. List of promoters’ group etc. Offer Documents to be made public – for Minimum 21 Days. 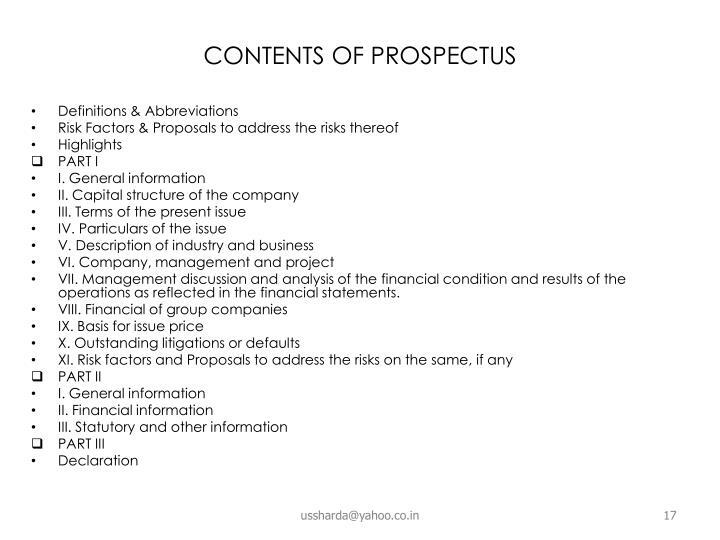 No Complaint Certificate – after 21 days from the date of making prospectus in public. Receipt of In principal approval from Stock Exchange (s) within 15 days from the date of filing. Collection centre – Four Metro Cities and cities where stock exchanges in the region. Meetings with mutual funds, Private Equity players and FIIs. Issue remain open for minimum 3 days and maximum for 10 days. Collection of application/ real time reporting of bids. 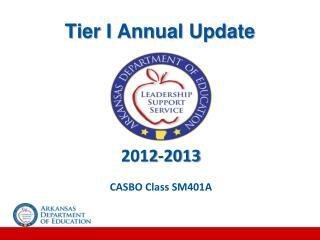 Periodical report by Lead Bankers. Allotment of shares in consultation with stock exchanges and lead manager(s). Post issue monitoring reports: These reports shall be submitted with in 3 days from the due dates. -In other cases – 3rd day from the date of closure of issue. 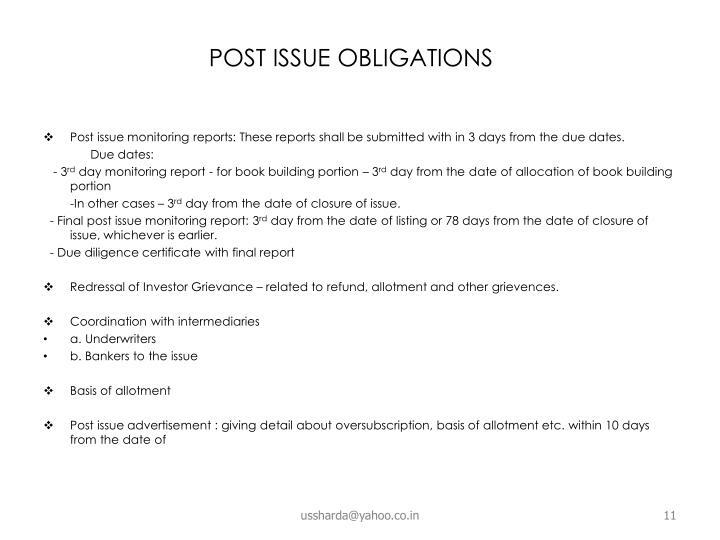 - Final post issue monitoring report: 3rd day from the date of listing or 78 days from the date of closure of issue, whichever is earlier. Redressal of Investor Grievance – related to refund, allotment and other grievences. A. In respect of Large Cap Companies with a minimum issue size of Rs. 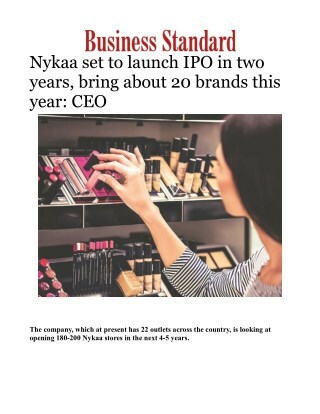 10 crores and market capitalization of not less than Rs. 25 crores. The minimum market capitalization of the Company shall be Rs. 25 crores (market capitalization shall be calculated by multiplying the post-issue paid-up number of equity shares with the issue price). B. In respect of Small Cap Companies other than a large cap company. The minimum number of public shareholders after the issue shall be 1000. A due diligence study may be conducted by an independent team of Chartered Accountants or Merchant Bankers appointed by the Exchange, the cost of which will be borne by the company. The requirement of a due diligence study may be waived if a financial institution or a scheduled commercial bank has appraised the project in the preceding 12 months. The Exchange follows a procedure in terms of which companies desiring to list their securities offered through public issues are required to obtain its prior permission to use the name of the Exchange in their prospectus or offer for sale documents before filing the same with the concerned office of the Registrar of Companies. 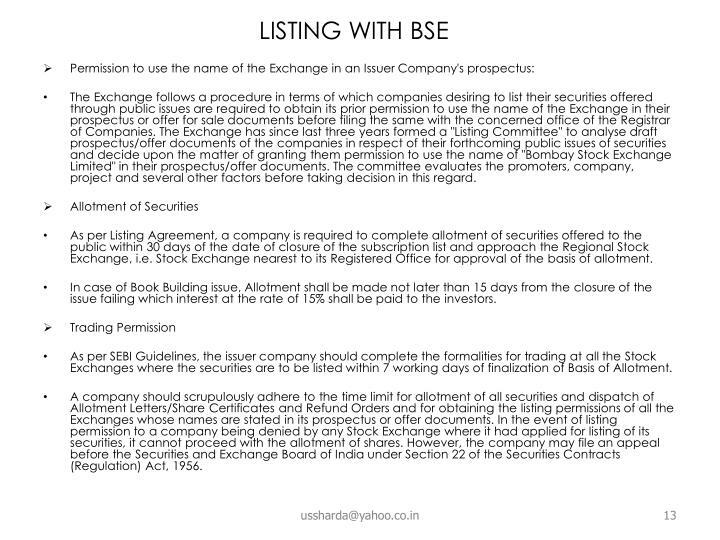 The Exchange has since last three years formed a "Listing Committee" to analyse draft prospectus/offer documents of the companies in respect of their forthcoming public issues of securities and decide upon the matter of granting them permission to use the name of "Bombay Stock Exchange Limited" in their prospectus/offer documents. The committee evaluates the promoters, company, project and several other factors before taking decision in this regard. 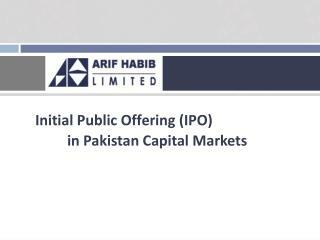 As per Listing Agreement, a company is required to complete allotment of securities offered to the public within 30 days of the date of closure of the subscription list and approach the Regional Stock Exchange, i.e. Stock Exchange nearest to its Registered Office for approval of the basis of allotment. In case of Book Building issue, Allotment shall be made not later than 15 days from the closure of the issue failing which interest at the rate of 15% shall be paid to the investors. As per SEBI Guidelines, the issuer company should complete the formalities for trading at all the Stock Exchanges where the securities are to be listed within 7 working days of finalization of Basis of Allotment. A company should scrupulously adhere to the time limit for allotment of all securities and dispatch of Allotment Letters/Share Certificates and Refund Orders and for obtaining the listing permissions of all the Exchanges whose names are stated in its prospectus or offer documents. In the event of listing permission to a company being denied by any Stock Exchange where it had applied for listing of its securities, it cannot proceed with the allotment of shares. However, the company may file an appeal before the Securities and Exchange Board of India under Section 22 of the Securities Contracts (Regulation) Act, 1956. 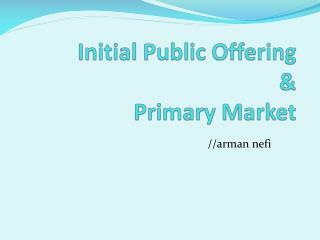 It is a process used for marketing a public offer of equity shares of a company. 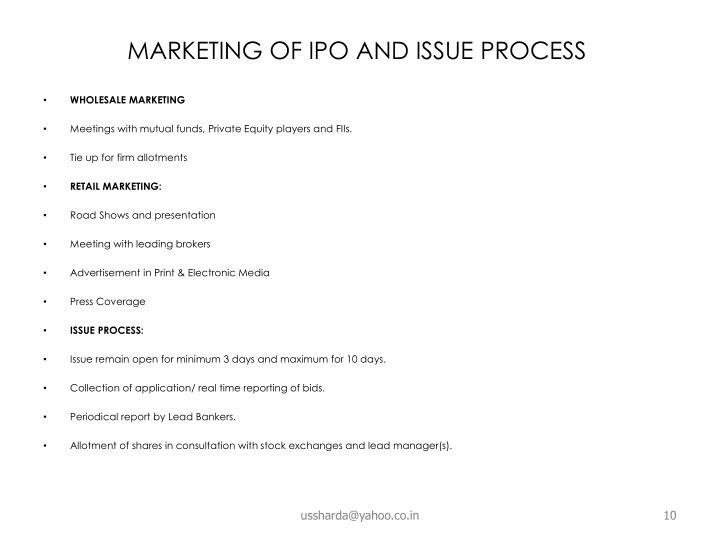 It is a mechanism where, during the period for which the book for the IPO is open, bids are collected from investors at various prices, which are above or equal to the floor price. The process aims at tapping both wholesale and retail investors. The offer/issue price is then determined after the bid closing date based on certain evaluation criteria. The Issuer who is planning an IPO nominates a lead merchant banker as a 'book runner'. The Issuer specifies the number of securities to be issued and the price band for orders. The Issuer also appoints syndicate members with whom orders can be placed by the investors. Investors place their order with a syndicate member who inputs the orders into the 'electronic book'. 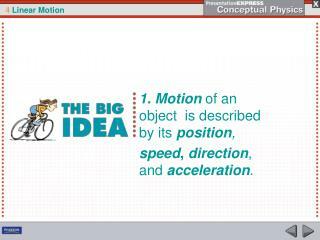 This process is called 'bidding' and is similar to open auction. A Book should remain open for a minimum of 3 days and maximum for 10 days. Bids cannot be entered less than the floor price. Bids can be revised by the bidder before the issue closes. The book runner and the company conclude the final price at which it is willing to issue the stock and allocation of securities. Generally, the number of shares are fixed, the issue size gets frozen based on the price per share discovered through the book building process. 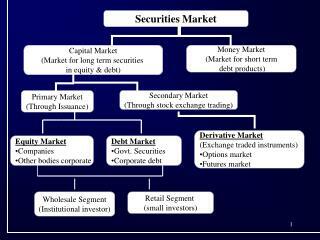 Allocation of securities is made to the successful bidders. 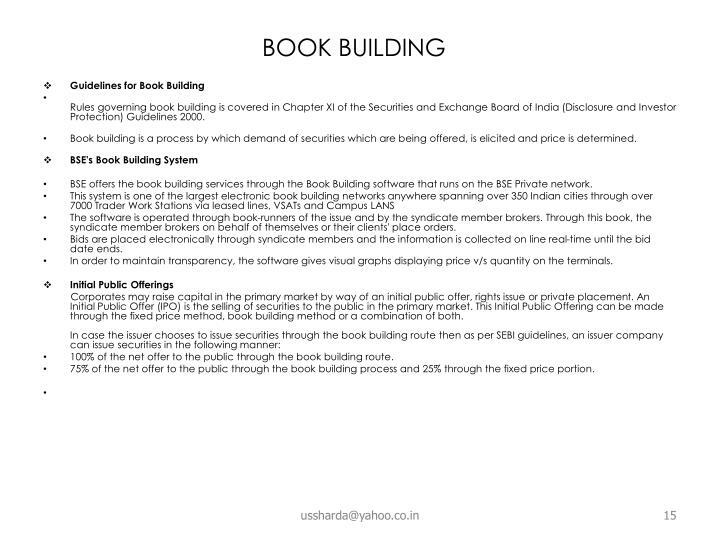 Rules governing book building is covered in Chapter XI of the Securities and Exchange Board of India (Disclosure and Investor Protection) Guidelines 2000. 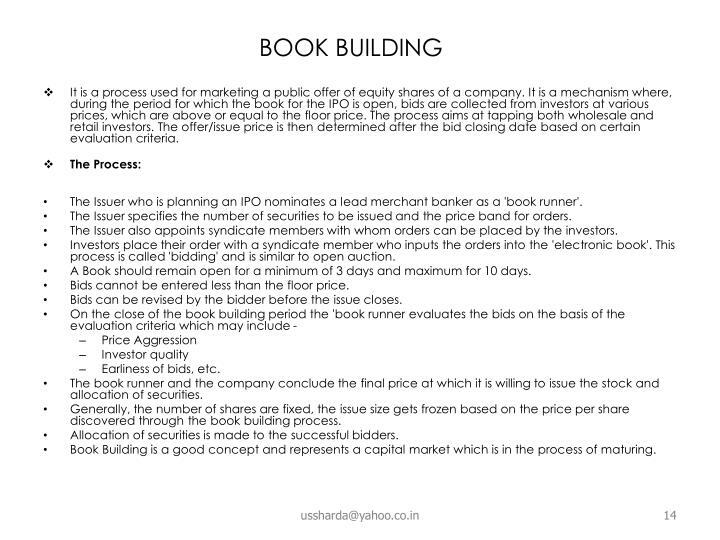 Book building is a process by which demand of securities which are being offered, is elicited and price is determined. BSE offers the book building services through the Book Building software that runs on the BSE Private network. The software is operated through book-runners of the issue and by the syndicate member brokers. Through this book, the syndicate member brokers on behalf of themselves or their clients' place orders. Bids are placed electronically through syndicate members and the information is collected on line real-time until the bid date ends. In order to maintain transparency, the software gives visual graphs displaying price v/s quantity on the terminals. 100% of the net offer to the public through the book building route. 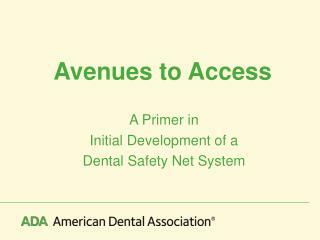 75% of the net offer to the public through the book building process and 25% through the fixed price portion. 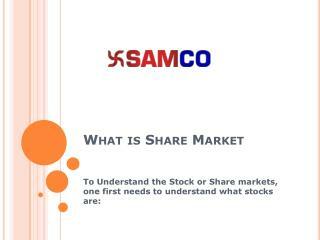 Price at which the securities are .offered/allotted is known in advance to the investor. 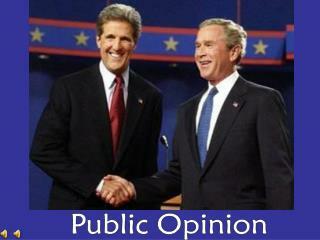 Demand for the securities offered is known only after the closure of the issue . VII. 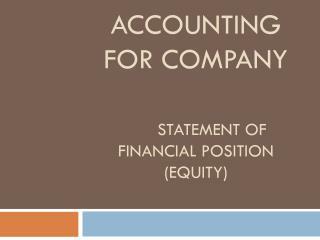 Management discussion and analysis of the financial condition and results of the operations as reflected in the financial statements. Shares of the company are listed with a stock exchange having nationwide terminals for a period of three years immediately preceding to the reference date. 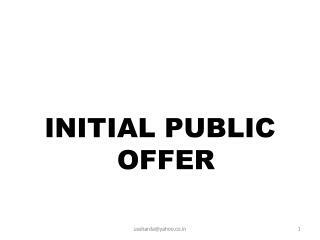 Average capitalization of public shareholding of the Company is at least of Rs.10000 Crores for a period of one year upto the end of the quarter preceding the month in which the proposed issue is approved by Board of Directors/Shareholders of the issuers. Company has redressed at least 95% grievances of the total shareholders/investors received till the end of the quarter preceding the month. Company has complied with all the compliance of listing agreement for a period of three years. Impact of auditors’ qualification if any, shall not affect the profit/loss by 5%. No prosecution/show cause notice issued by SEBI is pending against the Company, its directors or promoters. Entire promoters holding is in dematerialized form. A listed issuer company satisfying all the requirements specified in this clause and filing a red herring prospectus (in case of a book built issue) or prospectus (in case of a fixed price issue) with ROC or letter of offer with Designated Stock Exchange, as the case may be, shall simultaneously with such filing or as soon thereafter as reasonably practicable, but in any case not later than the opening of the issue, file a copy thereof with the Board. 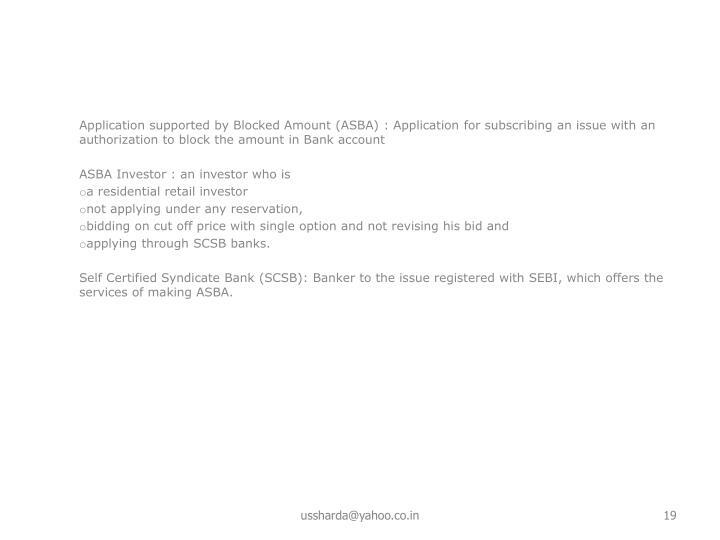 Self Certified Syndicate Bank (SCSB): Banker to the issue registered with SEBI, which offers the services of making ASBA. 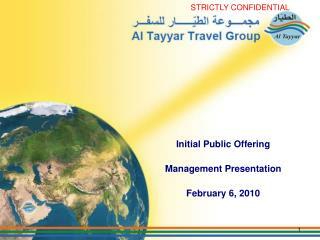 Initial Public Offering Management Presentation February 6, 2010 -Initial public offering management presentation february 6, 2010. disclaimer. 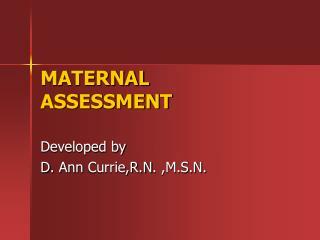 Initial Burn Care -. 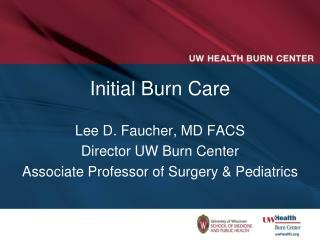 lee d. faucher, md facs director uw burn center associate professor of surgery &amp; pediatrics. objectives. discuss burn pathophysiology outline treatment modalities understand why some treatments better than others.